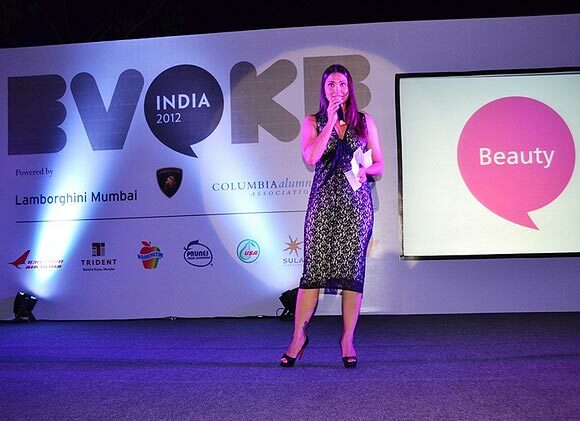 At EVOKE 2012, an idea-sharing event organised by the US Consulate in Mumbai earlier this month, former beauty queen and actress Lara Dutta partly blamed the media and male scriptwriters in the Indian film industry for the objectification of women, while sharing interesting insights into her career. Read on to know how the she defines beauty and why she'd like people to respect women for more than their physical attributes. As a former beauty queen, I'd imagine to know a little something about beauty. Besides, I have belonged to the industry for over 17 years. Beauty though, I believe, is relative. There is no universal measure or standard of beauty. Each demograph has its own definition and measure of what it considers beautiful. The pros and cons of beauty pageants have been debated for many years. Here, I am not talking about child beauty pageants which I am very much against, but beauty pageants for grown, adult women. The arguments have been pretty much the same over the years, the primary argument being the objectification of women. Beauty pageants have existed from the time of Aphrodite (Greek goddess of love, beauty, pleasure, and procreation) and have always intended to celebrate womanhood and beauty. In the 1950s and '60s, they saw young women participating to fund scholarships to universities, college grants and sponsorships that were also part of the prize package. I can, however, only speak from experience. The training I received for Miss India and Miss Universe was probably one of the most gruelling schedules I have ever adhered to. And it didn't end at getting the ratio of my hips and waist to a certain size. Personality development, speech induction courses, art of appreciation courses, including the Art of Living meditation course comprised the entire training programme. The idea of the contest was to send well-rounded -- no pun intended -- young women to represent their countries with all the diversifications of each's customs and culture. And I can tell you that my training held me in very good stead. Soon after I won the title, I was literally thrown off the deep end. I addressed leaders of state, the Harvard AIDS Institute, the United Nations -- the latter for a period of 10 years as a goodwill ambassador, a role I was appointed to as Miss Universe -- on issues as diverse as the HIV AIDS crisis in Asia, sub-Sahara Africa and the issue of female foeticide in India, besides politics and a myriad of other issues. Today, I can tell you that my face only got me that far. For most times, I had to rely on my wit and my intellect. I can also tell you that of all my attributes, it's not my face that I am the most grateful f#8744 it definitely is my gift of the gab. According to me, beauty is not dictated by society. I would like to define true beauty as the celebration of the individuality of a person's features. It's the goodness in them that radiates, sometimes it is also the quirkiness in character that makes them beautiful. Unfortunately for us, our view of beauty is defined largely by the media. A woman spends half her lifetime trying to fashion and sculpt herself into the mould projected by countless fashion magazines and advertisements the world over. As young women growing up, no matter how many times we are told that true beauty lies within or that each one is beautiful in our own individual way, most of these sentiments really ring very hollow, until we are well into our adult lives where rationale and maturity kicks in. Soon, we realise that 5'1" and a darker complexion is never going to look like the 5'11" porcelain-skinned models who are photoshopped into perfection on any fashion glossy or a television advert. This maturity also brings about a transformation and the ability to see and recognise beauty in what we earlier saw as flaws and imperfections. It also helps focus on cultivating and unearthing talent that would otherwise go hidden cloaked under outward beauty. It allows us to celebrate the beauty that might appear with a shy smile, or the contentment in a wide-toothed grin, or the slant of an eyebrow at the absurdity of a situation. Very often, a few unfortunate people who recognise the fleeting nature and impermanence of beauty also understand the frailty of life. And therefore grow into more compassionate people, who have a greater understanding of the suffering of others and in turn, truly discover an inner beauty that makes them far more attractive in their skin-deep avatar. At the same time, it is difficult to penalise a person who is born with natural good looks. Most of them who score less in the looks department quickly realise the advantages of having a pretty face. And there is no argument about the fact that a favourable countenance will be noticed faster. Of all the sensory perceptions, the sense of sight is probably the most powerful. And from a very young age, we tend to be attracted and to react favourably to physical beauty. It is often observed that those blessed with external beauty also cloak themselves with vanity and a sense of self-righteousness, believing in a way that they belong to a secret club where the privileges are their right, not offered to those who are less attractive. And I find this to be very true. Very often I encounter people who base their judgements of a person's character purely on what they look like. Good-looking people are also mostly considered not to be very smart. As a Miss Universe, through my travels through the world, whenever people knew that there was a Miss Universe in attendance, I can tell you this -- more often than not, they were ready to see a good-looking woman walk through the door, not necessarily a smart one. But this concept is also one of the biggest cliches I have encountered. There are numerous women, numerous examples of extremely good-looking women, who went far beyond their physical beauty and possessed minds of great wit and intelligence. Lauren Bacall, Katharine Hepburn, Rajmata Gayatri Devi...all women who were celebrated not only for their beauty, but also for their minds. I have to be honest here though and say that I have felt more objectified in the film industry -- and here I am talking about the Indian film industry -- than I ever did as a beauty queen. Ninety per cent of films in India have very flimsy written characters for women and one is usually subjected to playing the wife or the girlfriend of the male protagonist. There is hardly any layering or depth to female characters on screen. And maybe -- Prasoon (Joshi, screenwriter) might disagree with me here -- this could largely be due to the fact that most of the writers in the business are men. In the role of a producer as well, I struggle almost every day to be taken seriously, purely because of the way that I look. The biggest benefactors, though, of these insecurities and obsessiveness that women have about their looks is the thriving multi-billion dollar industry. The beauty industry that is constantly telling us that our skin needs to be fairer, our bodies need to be slimmer, our hair needs to be glossier, our derrieres need to be perkier and we buy into this almost every single day. All women will use whatever means at their end to make themselves as attractive as possible -- from teasing their eyebrows to colouring their hair to whitening their teeth to even going under the knife to slow down ageing, or just enhance a part of their anatomy. Some, though, have so much plastic in them that they are no longer recognisable as their true former selves. So what then is the limit to this pursuit of beauty? It's hard to say because it is so very individual in nature. But no thing is so eternally beautiful that after gazing at it for three days, or three weeks or three years, that at some point in time, you will not become impassive to it. I took a look at it today and realised that things have changed a bit. Now it says things like: I want to be wise, I want to be eccentric...so I like the person I have become. Some can say it's easy for me because I did achieve most of what I set out to do. I never walked in another person's shoes, (someone) who probably didn't look the way I do, and in that sense had it harder. And you're probably right about that in a way -- can't argue that. If anyone asked me still, whether I would rather be born beautiful or smart, my answer would still be that I'd rather be born beautiful. But at the end of my life when I die, I don't want to be recognised only as a pretty face. Because I believe that would be a grave injustice to all the good that inherently lies within me and within each one of you. In her speech, Lara Dutta said: If you are not born attractive, it's nobody's fault. But learn to look beyond your imperfections, embrace your inner beauty and let the world remember you for your talent, abilities and intelligence as well.